Tons of ink had been used to describe the musical career of the late Peter McIntosh. In late 1971 and before he, Bunny and Bob went following their own path he had already released some material on his own. So when it came to build up his own career after the Wailers adventure ended he was not new to the solo record business. This album was his debut as a major voice and character in Jamaica. The "toughest" of the three is here well intended to demonstrate that he is totally capable of delivering a classic set. This infact is what it is. A classic. Nine tracks fulfill the expectations. From the religious "Igziabeher", through the ganja anthem "Legalize It" to the semplicty of "Ketchy Shuby". In between there is "Burial" (Rasta no deal with Christian!) and "No Sympathy". "Till Your Well Runs Dry" runs between a slow mood atmosphere and a Roots one. The set closes remembering the old times with an almost Rocksteady song: "Brand New Second Hand". This album was produced by himself. The musicians here are: Peter Tosh (vocals and guitar), Carlton Barrett (drums), Aston Barrett and Robbie Shakespeare (bass), Al Anderson (guitar) and Tyrone Downie on keyboards. The set was recorded at Randy's (Kingston, JA) and Treasure Isle (Kingston, JA). It was engineered by Karl Pitterson and Jerry Smith. Believe it or nor, this is a classic. And like this it will always be remembered. This album along with "Equal Rights" is the highest point reached from Tosh. Freedom, justice and equal rights for all are the founding elements around which the late Peter Tosh built this seminal self-produced album in April 1977. Since the previous year Jamaica had faced a terrible bloodshed that brought the island on the verge of a civil war. Roadblocks were everywere, the presence of the police did not mean to be in safe hands and the rival gangs supported by the PNP and the JLP parties respectively claimed the lives of two thousand people. For Tosh it was the moment to say something strong: " I don't want no peace... I need equal rights and justice!" Addressing the whole nation and all the oppressed there and especially Africa, he went in the studio with some great friends and musicians to record this set. Eight songs reached the final release: "Get Up, Stand Up", "Downpressor Man", "I Am That I Am", "Stepping Razor", "Equal Rights", "African", "Jah Guide" and "Apartheid". Disc one of this special edition also adds seven previously unreleased tracks from the original session: the list includes "400 Years", "Hammer (here presented as the Extended Version)", "Jah Man Inna Jamdung", "Vampire", "Babylon Queendom", "You Can't Blame The Youth" and "Mark Of The Beast". All the rhythm tracks were recorded at Randy's (Kingston). Subsequently the overdubs were done at Dynamic Sounds, Joe Gibbs Studio and Aquarius. The tracks were mixed in Miami at Criteria Studio by Karl Pitterson with the addition of Alex Sadkin and Jack Nuber. The people that recorded this album were: Bunny Wailer, Rita Marley and Judy Mowatt (backing vocals); Carlton Barrett and Santa Davis (drums); Aston "Family Man" Barrett and Robbie Shakespeare (bass); Donald Kinsey and Al Anderson (lead guitar); Tyrone Downie (keyboards); Ras Lee and Robbie Shakespeare (harp); Harold Butler (clavinet); Dirty Harry (tenor sax); Bobby Ellis (trumpet); Skully (also known as Mikey Spratt, Zoots Scully Simms, Scollie, Zoot Sims and Skitter) (percussions); Abdul Wali (guitar). Peter is of course on vocals and guitar. This special edition offers fifteen bonus tracks on Disc two. The list includes: "Get Up, Stand Up" (previously unreleased original session alternate and extended version), "Dub-Presser Man" (previously unreleased Dub version), "I Am That I Am" (previously only available on extremely limited edition Dub Plates - credited to ShaJahShoka), "Heavy Razor" (previously only available on extremely limited edition Dub Plates - credited to ShaJahShoka), "Equal Rights" (previously unreleased original session alternate and extended version), "African" (previously only available on extremely limited edition Dub Plates - credited to (London Sound System), "Jah Guide" (previously only available on extremely limited edition Dub Plates), "(Fight) Apartheid" (previously unreleased original session alternate and extended version), "Vampire" (previously unreleased demo from the original session), "Jah Man Inna Jamdung" (previously unreleased demo from the original session), "Hammer" (previously only available on extremely limited edition Dub Plates - credited to ShaJahShoka), "Blame The Youth" (previously unreleased Dub version), "Babylon Queendom" (previously unreleased Dub version), "Vampires" (previously unreleased Dub version) and "Get Up, Stand Up" (previously unreleased original session alternate and extended version). This set is not "take it or leave it". 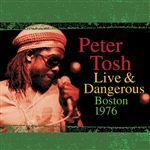 Even if I am not such a great fan of Peter Tosh, this set is for sure as strong as his previous studio effort. And if maybe you do not feel transfixed by the music as it happens with me, listen carefully to the lyrichs. This set is a neverending call for justice! Sly Dunbar and Robbie Shakespeare, Wire Lindo, Tarzan Nelson, Al Anderson and Donald Kinsey play for Peter "Toch" in this first class classic 1976 live set. Tosh was known as a militat Reggae subversive and it is a pleasure to hear something much more radical - maybe - than the "Complete Captured Live" set. If the latter got the deserved attention, this set could be considered as the real Tosh live sound. From time to time some accusations come up about Peter being racist in his speeches between his songs. I do not feel them such a racist statements but only a way to remind the listeners about what black men and women didn't ask for: slavery. By the way this album brings the tough vibes of a Tosh live performance. The extended intro of "Igziabeher" sets the atmosphere as lightning & thunder. And this must be remembered as one of the most beautiful beginnings for a Reggae live concert. "No Sympathy" is such a declaration that you must only hear to the lines to get it. "Burial" - with the speech "Rasta is not going to his funeral" - speaks by himself. All the rest is pure 70's Tosh live vibes. This is a disappointing album because it lacks the true jamaican Tosh sound. In 1978 Peter Tosh met the "Glimmer Twins" (Mick Jagger and Keith Richards) at the One Love Peace Concert in Kingston. They clearly shared some vibes. Let me put it like this: I don't know what but something happened. At this point Tosh started to record his next album at Dynamic Sounds (Geoffrey Chung engineers) and at Joe Gibbs Studio (Errol Thompson engineers). After that Tosh, Sly and Robbie and the engineer Karl Pitterson moved to the US to remix the set. Unfortunately this did not bring good results. The blues guitarist Donald Kinsey was invited to add the lead guitar. A tour supporting the Stones followed. The intention was to have an album which would help Tosh to enlarge his commercial spectrum. The final product is uncertainl. 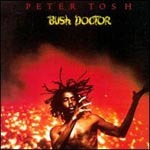 Tosh kept his Rastafari position firmly but the music sounds soft and mellow without a tough imprint. Listen to "Moses" and you get what I mean. The best track here is not the overrated "Don't Look Back" (with Jagger on vocals too) but the great "Bush Doctor". "Pick Myself Up" is a classic uncorrupted Tosh tune. This 2002 re-release has some extra material. What is very interesting is "Lesson In My Life". This song had to be put in the album. The rest is pretty innocuous. As the original album itself. At the end of 1981 Peter "The Toughest" Tosh formed a new band after the departure of the musical super duo Sly & Robbie. The new group World Sound & Power was created around the core members of the Soul Syndicate. The set opens with the title track which seems to have been inspired by Tosh journey to Nigeria. The musically simple "Glass House" has a strong message about how to behave: beware how you act because every move has its (social and political too) consequences. The freedom fighter is present with "Not Gonna Give It Up". "Stop That Train" is an old song from the Wailers era and this version still has its own power even if it is a little bit too smooth. The not so loved by Peter "Johnny B. Goode" is a beautiful version and "translation" in Reggae of one of the greatest Chuck Berry songs. "Where You Gonna Run", a track written by the guitarist Donald Kinsey, addresses the necessity to embrace love as the only solution since there is no other way for the problems of the world. "Peace Treaty" recalls the epocal event when, during the 1978 One Love Peace Concert held in Kingston, Bob Marley brought on stage Edward Seaga and Michael Manley to shake hands as a sign to start to bring again the nation together. Unfortunatelly, Peter says, that was only a terrible farce. "Feel No Way" is about stopping to be worried because at the end we will be judged by the Almighty. "Maga Dog" comes from a Jamaican folk saying. The malniurished dog you help one day will betray you. This album was recorded at Dynamic Studios, Kingston. As could be expected the lyrical message is very strong but I was never such impressed by Tosh music, except of course by some early material which is really touching. In any case this set is remembered as a very good one from Tosh. This two discs set covers an outdoor night in Los Angeles (Greek Theatre, August 22, 1983). This set was to promote the "Mama Africa" album. First of all do not expect anything like the marvellous and powerful "Live & Dangerous" live album. From my point of view that is one of the greatest live set ever recorded of Jamaican music. Quality speaking this is far lower than the 1976 set. But why? From a certain point of view here the tracks are not that great but that is not the main reason. The reason is that the mood is absolutely different. The previous was dark and deep, this one lacks that atmosphere and it is quite uninspired. Fortunately there is something that deserves the right attention. The medly of "Equal Rights / Downpressor Man" has the right slow vibes that you would expect from Tosh on stage. This is a very nice version. The famous "Bush Doctor" has the same strength as always. "Johnny B. Goode" has the right substantial power to overshadow any other attempt to convert a Rock or R&B song into a Reggae one. The final product in an average Roots (maybe too much, musically speaking, commercially spiced) concert played by skilled musicians. This compilation offers a quite good look on the "toughest", as Peter Tosh liked to be called and considered. Generally speaking 99 percent of the compilations are focused on the major commercial hits but not on the real high quality material. In this case the compiler concentrated on both. Here you will find for sure some of the best songs that Tosh recorded and in some cases those are pure gems. Songs loke "Downpressor Man", "Equal Rights" or "Legalize It" are for sure good tunes that capture the pure Tosh sound. But the Tosh that I prefer is that one which stands on a darker edge with songs like the ganja anthem "Bush Doctor" and the great and oscure "Igziabeher (Let Jah Be Praised)". Of course the compilation contains "(You Gotta Walk And) Don't Look Back" but this is really an overrated track that became famous thanks to the presence of Mick Jagger on vocals along with Tosh. In any case this set is a pretty good one for new comers. For there others there is a very interesting acoustic version of the ultra-famous "Get Up, Stand Up". Before this last song there is a pre-Island Rocksteady version of "One Love". This is a classic tune of the very early Wailers' period but here it stands alone as a track that really does not represent Tosh as a solo artist. This eighteen tracks set mainly delivers the tracks recorded by Mr. McIntosh alone around 1969-1972. Almost all of the songs state Peter's faith in rightiousness and underline the importance of Black History. Some of this quite raw material clearly demonstrates how much importance was given to the folk tradition in these early Reggae days. "Maga Dog" is a good example, as the gospel of "Go Tell It To The Mountain" is. The Black issue is covered in "Here Comes The Judge" where the colonial heroes are judged as evil enemies. This track is also quite interesting since it is slightly built over the "Satta Massagana" rhythm. An off guard catching song is the version of the Beatles "Here Comes The Sun": an example, as many others in Reggae history, that whatever song can be translated through the Reggae principles. Amazing indeed. Tosh plays the melodica in some songs too. This set is a good occasion to explore what came before the Wailers success and before he went solo. Check it out.